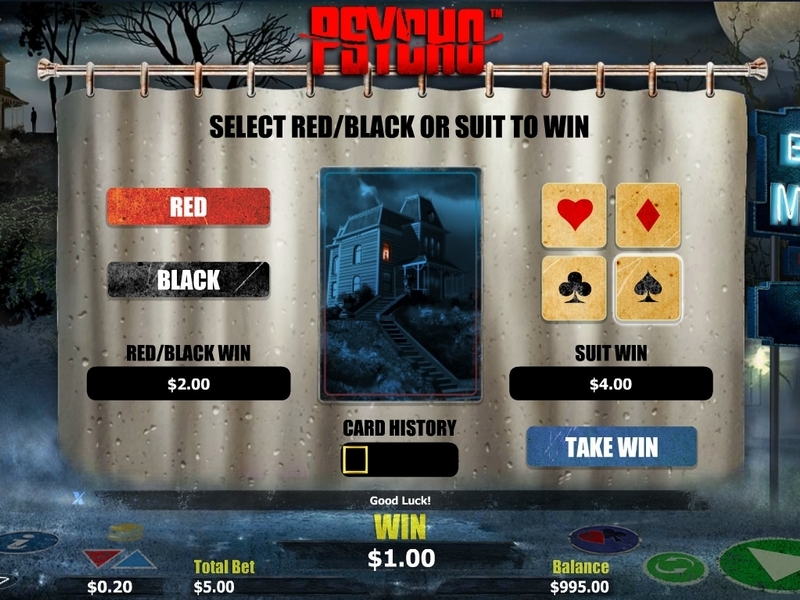 Psycho is a NextGen Gaming-powered video slot game with 5 reels and 25 paylines. Playable from 25p a spin, the online slot game has been produced in partnership with Universal Studios and is based on Alfred Hitchcock's 1960 film which is regarding as one of the best films of all time. 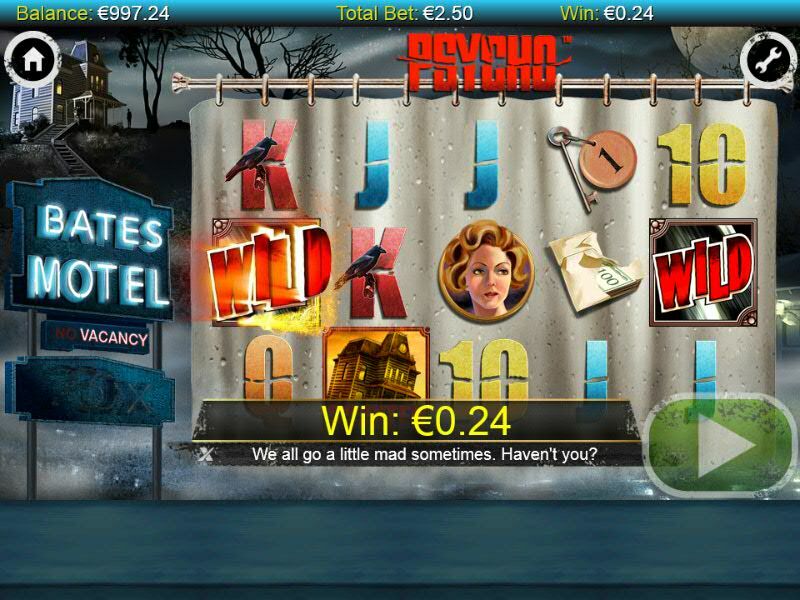 With brilliant graphics, animations and a chilling soundtrack, you can benefit from Psycho Wilds where wins with a wild can be multiplied by up to 20! In the free spins feature, you can get up to 20 free spins with wild wins subject to a massive 40x multiplier – this is a medium to high variance classic in the making. 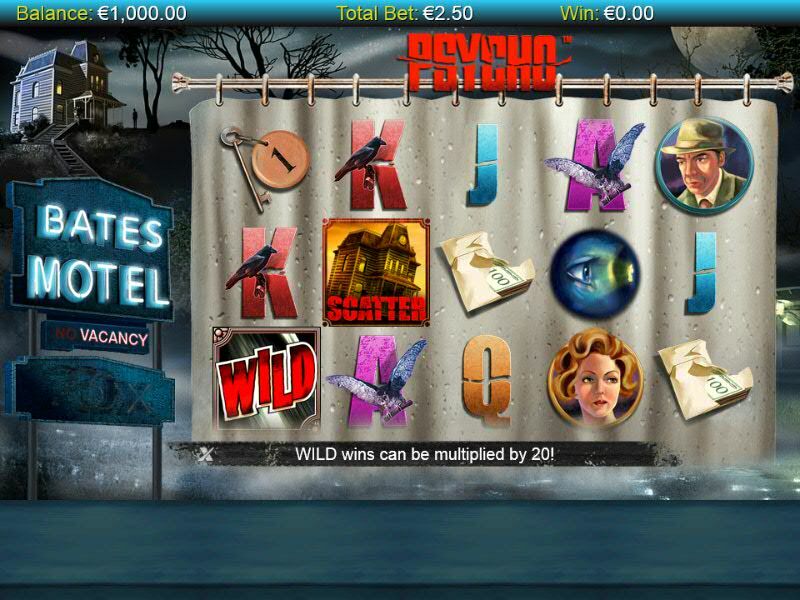 The online slot game is set in an isolated wooden house which sits on the hilltop overlooking the mysterious Bates Motel which is in the middle of a dark and chilling countryside where it’s always raining. You will see a silhouetted figure lurking in the window surveying the area and watching over the new arrivals at her hotel whilst a young man (Norman) attends to the guests with enthusiasm. Psycho is visually brilliant in its mysterious setting and has a thrilling soundtrack that really brings the essence of the iconic film back to life – you will notice the gameplay is centred on the iconic ‘shower’ scene. You can play from as little as 25p to as much as £50 a spin. When it comes to Psycho game features, you can benefit from Psycho Wilds as these wilds may be added to any spin. If you a have a win with wilds in the base game, they can be multiplied by 2x, 3x, 4x, 5x, 10x or even 20x! These are applied randomly so hopefully you’ll get a big hit on the big multipliers. Then you have the Free Game feature which is triggered when you get 3 or more Haunted House scatters – 3 will give you 10 free spins, 4 will give you 15 free spins and 5 will give you 20 free spins. More wilds will appear in the feature which is important and wins will wilds may be multiplied by 2x, 4x, 6x, 8x, 10x, 20x or 40x. Could you imagine a wild win with a huge 40x multiplier? Finally, it’s good to know that the feature can be retriggered (by getting 3 or more Haunted House scatters during the feature). I really like the Psycho slot game as it’s a medium to high variance slot – NextGen Gaming released the branded Judge Dredd which was ok but this release is just superb. There are very big wins to be had in Psycho win a maximum win of over 750 times your stake in the base game and over 1,500 times your stake in the free spins feature – this puts Psycho on par , in terms of variance, with the cult 300 Shields (also by NextGen Gaming).